The most common forms make it hard to pick out the red, yellow and green part of the spectrum and are popularly called Red-Green Colour Blindness. Rarer is the Blue-Yellow version. And there are some even rarer versions, including one where no colour can be seen – in fact there’s an island in the Pacific where 10% of the population can’t see colours at all. Is it possible my child might have colour blindness? It isn’t always easy to diagnose colour blindness in kids. Sometimes the effect is mild, and the child may not even know they aren’t seeing colours correctly. Often around the age of 4 a child might start having difficulty with naming colours or separating things by colour. If you are concerned, visit an optometrist, or ask your GP for a referral to an ophthalmologist. Is the condition a problem – and can it be corrected? Colour blindness is not a disease, it’s a condition. It cannot be cured. Discovering that you have colour blindness can make dealing with it in everyday life much more straightforward. People use a range of strategies to make up for colour blindness. They might, for example, understand traffic lights by the position of the light if they can’t tell the colour. On a dark rainy night, that can be very hard! Generally it doesn’t prevent someone getting a standard driving licence, though not necessarily a commercial licence. Colour blindness can make some occupations difficult or even illegal. Electricians, pilots, police, truck drivers, seamen and some jobs in the defence forces can be affected. Do you cut the red wire or the green one? Of course it affects other professions in less dangerous ways, artists and craft workers, for example, though there’s no evidence it affects anyone’s ability to draw. Even simple daily activities like recognising ripe fruit can be tough. There’s a growing number of apps that can help with everyday situations. Ophthalmologists do sometimes prescribe tinted lenses for some forms of the condition. What’s the ideal test for colour blindness? Developed 100 years ago, the Ishihara Test is still the best test to see if you have the condition. A more recent test, the 100-Hue Test or Colour Hue Test can provide more detailed information. There are online versions of both these tests, which of course you can try, but for a variety of reasons the online tests are not considered strong enough (computer colours vary, for example). As there’s a great range in how colour blindness affects individuals, eye specialists now have a raft of further tests and equipment they can call on, including the RGB anomaloscope. 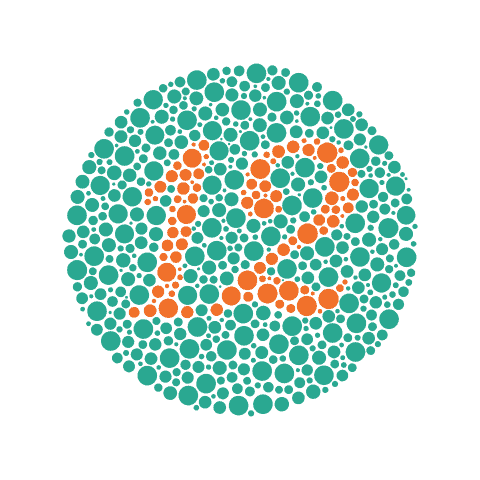 If you are concerned about colour blindness, you should see an ophthalmologist or optometrist. Some school health services also offer the test, or you can ask your optometrist next time you’re having your regular eye check-up. Ishihara Plate No. 1 (Number 12). Used to for the en:Ishihata test of color blindness. Help us reduce the incidence of this condition. As well as testing for the condition, Sydney Eye Hospital treats the diseases that can lead to colour blindness such as macular degeneration, and is undertaking significant research into them. This has life-changing potential. Join us in supporting this research and the Sydney Eye Hospital’s many other programs dedicated to eye health and cutting-edge solutions to eye disease.